After the bombshell dropped on us last time, the revelation that Dorulumon used to be in the Bagra Army, we're expecting some serious fireworks. Will Dorulumon fight his former boss? Will he turn on the Fusion Fighters? Will anyone actually stay the hell dead? The answer... is no on all counts. We do get some serious fireworks, but it turns out to be either secondary action with little short-term significance or a conventional battle against a bad guy we could have sworn died last episode. These do well to add intensity and pace to an episode struck by a sudden outbreak of common sense. Maybe Data Squad's campaign against rationality was on to something. Far too often in any story, we're frustrated when characters refuse to stop and think about what's going on. How much unwarranted drama is caused by a simple lack of perspective, misunderstandings or emotions causing a poor response? What if Matt recognized that Cherrymon had an obvious agenda in turning him against Tai? 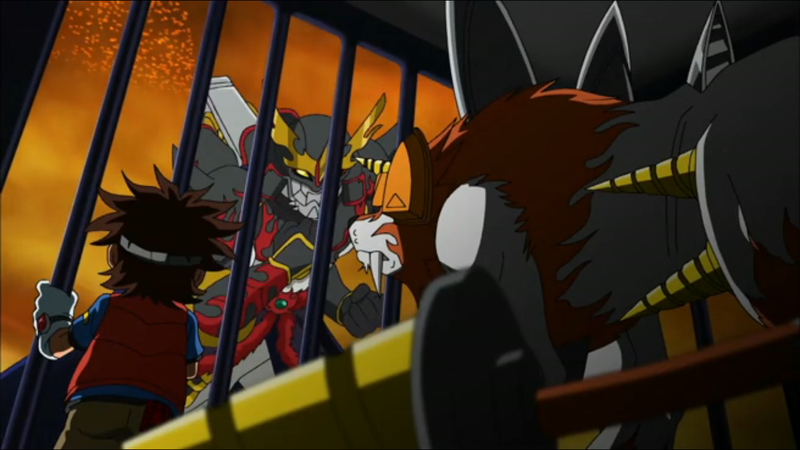 When Beelzemon killed Leomon, what if Takato stopped and collected his senses before losing his mind and making a bad problem worse? What if Marcus had actually learned to trust Thomas instead of going bananas at the first sign of betrayal? That's right... it would all be really boring and we'd have nothing to entertain us. That's sort of what's going on here. We've got news that Dorulumon had once joined the dark side. 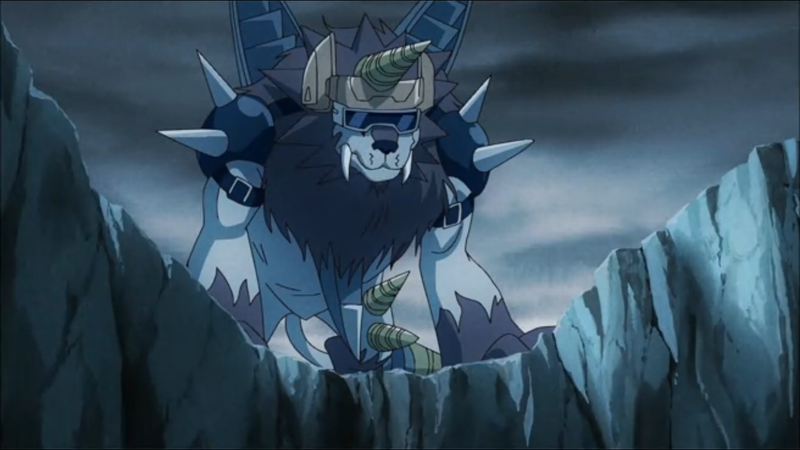 In the past, and possibly still, Dorulumon was no better than Matt, Beelzemon or Thomas. The Fusion Fighters are suddenly leery of Dorulumon and have their share of misgivings, but all it takes is one act of support and a good reference from BlueMeramon to ease their doubts and make him a permanent party member. There's no ally-on-ally violence, no dark evolutions... cooler heads prevail with few problems. While that's all fine and dandy for the good guys, it does take a lot of the drama out of the scenario. The big reason for this is that Tactimon accidentally shifts the emphasis from Dorulumon being a member of the Bagra Army to Dorulumon betraying the Bagra Army. His thought process was illustrating that not only was Dorulumon on his side once, but that he turned his back on him, an unforgivable atrocity in Mikey's eyes. That's the big accusation, and Tactimon paints Dorulumon not as a double agent, but as a double crosser. BlueMeramon takes care of that, filling in the blanks by explaining that Dorulumon didn't so much betray Tactimon so much as he went AWOL after learning that Tactimon views his legion of ground troops with the same philosophy and respect as Zapp Brannigan. We don't know enough about that particular campaign to judge Tactimon for declaring his troops expendable, but that sort of thing will make anyone's self-preservation instincts kick in. Hell, good on Dorulumon for saving BlueMeramon and company. Mikey realizes this and accepts the reasoning, never bothering to ask what the hell Dorulumon was doing on Tactimon's team in the first place. The battle between the two former allies isn't happening. Christopher hears that Tactimon's in town and picks a fight with him in a very presumptuous play for some extra crowns. It's main event material, but takes second billing to yet another round between AncientVolcanomon and the Fusion Fighters that ends the same way. Hopefully he'll stay dead this time. Then they find the code crown because it's been three episodes and they need to get the hell out of there. Tactimon wields the Sword of Storms. Not a Storm of Swords. Not at all, nosiree. 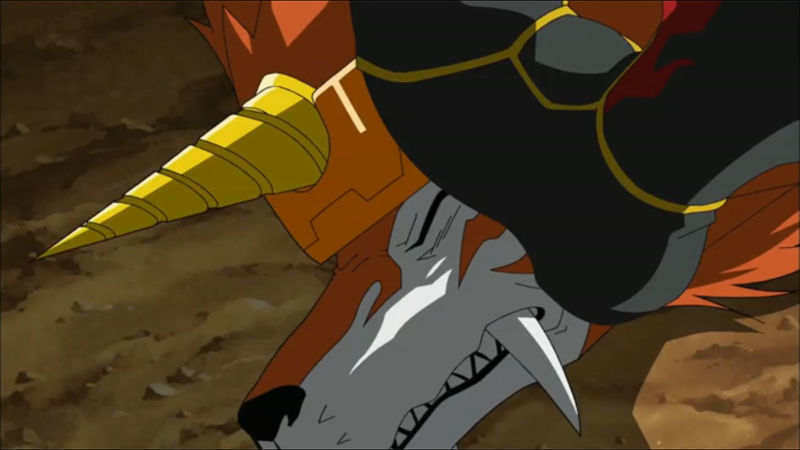 Shoutmon refusing to leave Mikey as a sitting duck against Tactimon (and maybe Dorulumon) was a nice reflection of Mikey's influence, if a little obvious. Jeremy's Ahnuld impression has made me realize that anything and everything he does is immune from “silly dub” status since it means he's doing something. That puts him a notch above Zenjirou. Can we talk about BlueMeramon for a second? He's more sensitive toward the slaves. Everyone exonerates Dorulumon for ditching Tactimon under those circumstances, but the lower-ranked BlueMeramon apparently stays on board? Yet he's willing to betray Tactimon to repay a life debt? Give this guy his own series. Why did Tactimon put Mikey's Fusion Loader on a pedestal in a cave? Toss that sucker into a volcano and that's one army rendered powerless. Anyone noticed that Mikey never plugged in the Code Crown from Magma Zone.He just left.This means Magma Zone isn't yet his.LOL.